Hearing aids can make a life-changing difference to the hearing impaired. But how do hearing aids work? We take a closer look at the technology. The tiny miracles known as hearing aids help improve a wide range of hearing impairments. With an aging population, failing eyesight and hearing issues are common health problems. Private retailers and the VA combined to sell almost 3.65 million hearing aids in 2016. From a small amount of hearing loss to greater hearing difficulties, today’s hearing aid technology helps just about anyone suffering from hearing loss. But how do hearing aids work? Let’s take a look at the basic functions of how a hearing aid helps millions of people hear better every day. Most hearing aids contain the same five internal components. These components are critical for a hearing aid to help improve your hearing. A hearing care technician programs the computer chip to your individual needs. These chips can adjust as your needs change over time. While most hearing aids include these critical components, the construction of a hearing aid varies from style to style. But how do these components work together to help you hear? Today’s digital technology has improved over old analog hearing aid functionality. Digital processors help your hearing aid “think” as it distinguishes between important sounds vs. noise. Here’s the basic flow of a sound through a hearing aid. It starts with the microphone. This component picks up sounds and sends them to the processing computer chip. The chip analyzes the sounds. The analyzed (or interpreted) sounds then go to the amplifier. Amplified sounds then go to the loudspeaker. The loudspeaker sends sounds to the inner ear through tubing placed into the ear canal. This is the tube you’ve probably noticed connected to the hearing aid. This process happens in a split second from when a sound happens to when it reaches the brain. The result is your ability to hear sounds clearer and louder with the help of a hearing aid. There’s no need to fear a clunky hearing aid that doesn’t help you in the ways you need to improve your hearing. Devices are smaller, smarter, and better equipped to help varying degrees of hearing impairment. Where Do I Get a Hearing Aid? It’s easier than ever to get a hearing aid. And there’s plenty of help available to find the best hearing aid for your needs. Your first step is to talk to your doctor. Let your doctor know if you’re experiencing hearing loss or difficulty isolating sounds in conversation. Your doctor will perform a medical exam to make sure underlying health issues aren’t the cause of your hearing issues. They’ll also give you an audiological exam. Or they might refer you to an audiologist for more extensive testing and options. Depending on your insurance, you might be eligible for partial or full cost coverage of a hearing aid. An audiologist or hearing health care professional can help you find the best hearing aid for your needs. You can also visit hearing aid retailers. Find a hearing aid brand you like or seems to work best for you. There are plenty of manufacturers to choose from, including Starkey and Liberty. Read more here to learn about buying Liberty hearing aids at a major retailer. How Do Hearing Aids Work to Improve My Life? Understanding how a hearing aid works might help you believe it’s time to take advantage of advances in the technology. If you’ve been putting off getting a hearing aid, think of the ways it could improve your life. When it’s hard to hear, it’s hard to communicate. Communication is critical in any relationship. Your relationships might suffer when you can’t hear or respond in appropriate ways. A tiny hearing device can help you hear and respond in ways that improve the relationships in your life. When it’s difficult to hear in crowds, at parties, or over dinner, you might begin skipping opportunities to socialize. A hearing aid can help group situations easier to navigate and help you enjoy a busier life. Decreases in socialization lead to isolation. This can also lead to depression, a lack of confidence, and anxiety. As your brain experiences less stimulation from outside sources, you can also suffer from memory loss. Using hearing aids keeps your brain engaged and helps reduce the negative effects of hearing loss. If you’ve noticed a loved one spending more time alone while struggling with hearing loss, talk with them about a hearing aid. Improved hearing might help them feel more confident to interact more with friends and family. 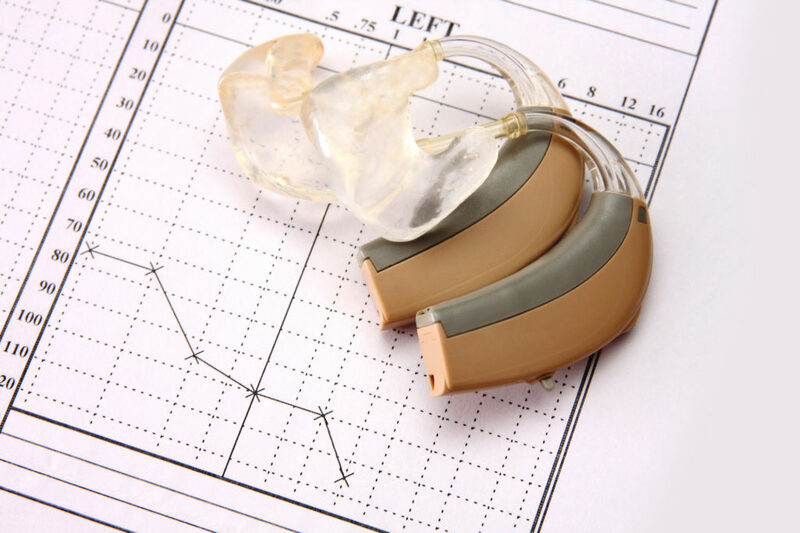 With today’s technology, some hearing aids are smaller than ever. Depending on the aid that works best for you, people might not notice you’re wearing a hearing aid. Now that we’ve answered the question “how do hearing aids work?” you’re ready to talk to your doctor and find the perfect aid for your needs. There’s no need to suffer. Digital hearing aids adjust to your hearing needs–large or small. Struggling to hear conversations and avoiding social situations can be a thing of the past. While you’re improving your hearing, take care of your eyesight too. If you’re looking for contacts, read our article to learn about the best contact lens brands for you.